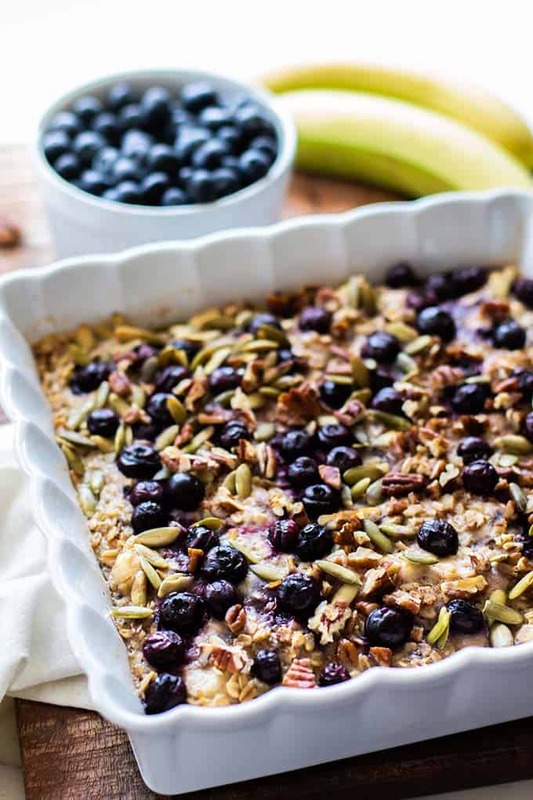 Start the day off right with this healthy Blueberry Banana Baked Oatmeal. Making large casserole breakfasts is a great way to feed your family and be sure of leftovers for the days ahead! 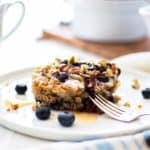 This easy healthy baked oatmeal is naturally sweetened with bananas, and topped with crunchy pecans and pepitas. Trying to continually come up with healthy breakfasts to feed a family isn’t easy! 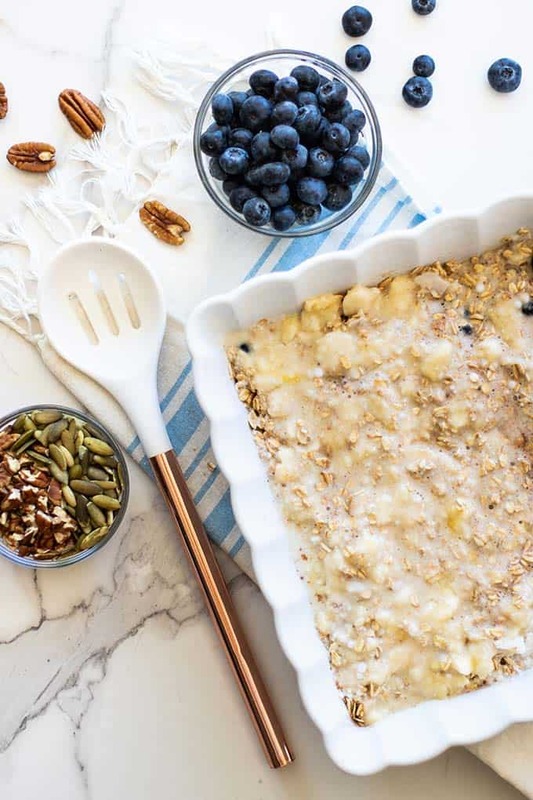 If you’re looking to mix up your routine of eggs and cereal, this baked oatmeal is just the ticket. 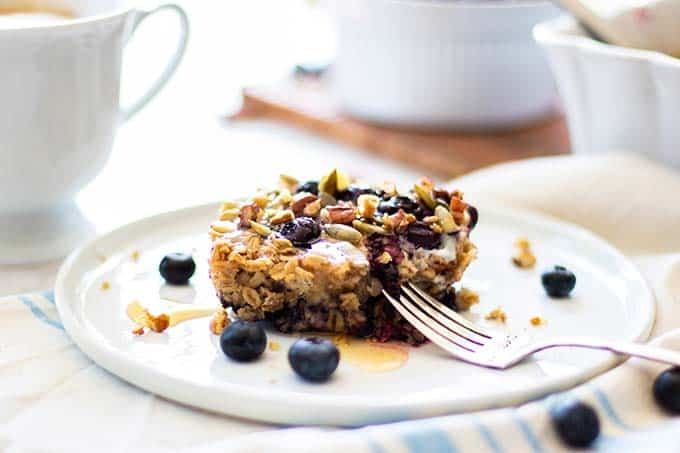 A lot more fun than just a bowl of oats, this blueberry oatmeal bake is easy to put together, and feeds a crowd. This casserole will easily feed a family of 4 for 2 days. If you’re cooking for 2, you’ve got breakfast for most of the week! This recipe layers juicy blueberries (I have them on hand frozen all year long! ), oatmeal spiced with cinnamon, and a banana sweetened almond milk mixture. Put this casserole together in 10 minutes in the morning and pop it in to bake, or prep it the night before. It can even be baked the night before, and then the slices can be reheated as needed throughout the week. We’ve loved this baked oatmeal so much, I am already dreaming of a pumpkin spice version! 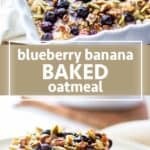 I love recipes like this oatmeal that use ingredients that most of us have on hand. I rely on extra ripe bananas to sweeten this casserole. If you’re family typically sweetens their bowls of oatmeal, you’ll probably want to add a bit of the same sweetener here. I’d rather keep it clean, and then allow everyone to add a drizzle of honey or maple syrup to taste. Not only does that allow for the option of no sweetener, but adding a drizzle of honey on top allows you to really taste the sweetener, meaning you can use less for the same sweet taste. And I am all for coming up with ways to reduce added sugar! Add blueberries across the bottom of a baking dish. 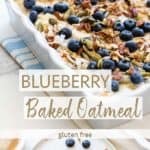 Mix together oats, with a little sea salt, baking soda, and cinnamon, and then top the blueberries. Mash ripe, sweet bananas with eggs, almond milk and coconut oil, and then drizzle over the top. 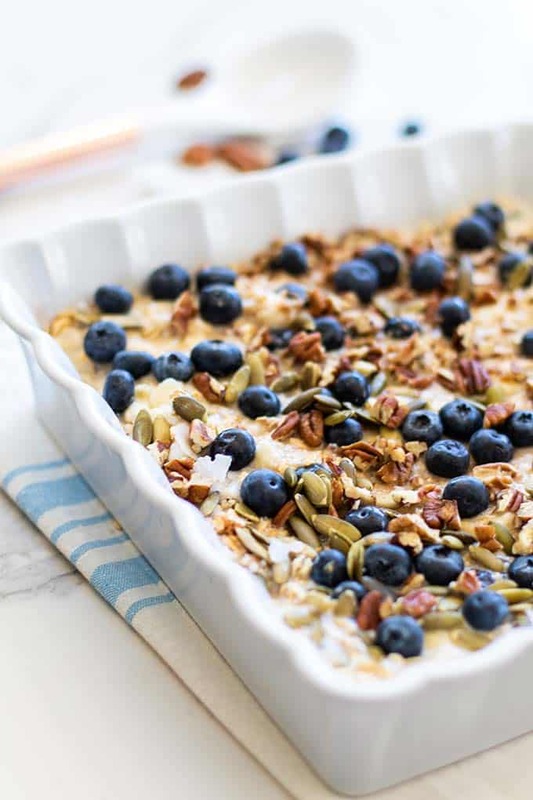 Top with some extra blueberries and if you’d like, add some crunchy nuts and seeds to boost the protein and healthy fats, and add some great texture! I am all about preparing healthy meals that make great grab-and-go options, and this one checks off all the boxes. While it needs 40 minutes to bake, the hands-on prep time is only about 10 minutes. Blueberries: Add extra banana, or use another berry. Almond Milk: Use regular milk, or coconut, rice, or soy milk. Eggs: Make this vegan by using 2 tablespoons of flax meal or chia seeds. Simply mix the seeds into the banana and milk mixture. Pecans: The nuts are optional. You can also toss on chopped almonds or walnuts, and sunflower seeds would be great as well. Once you have it put together, you can either bake right away, or cover with plastic wrap and let it sit overnight to bake in the morning. 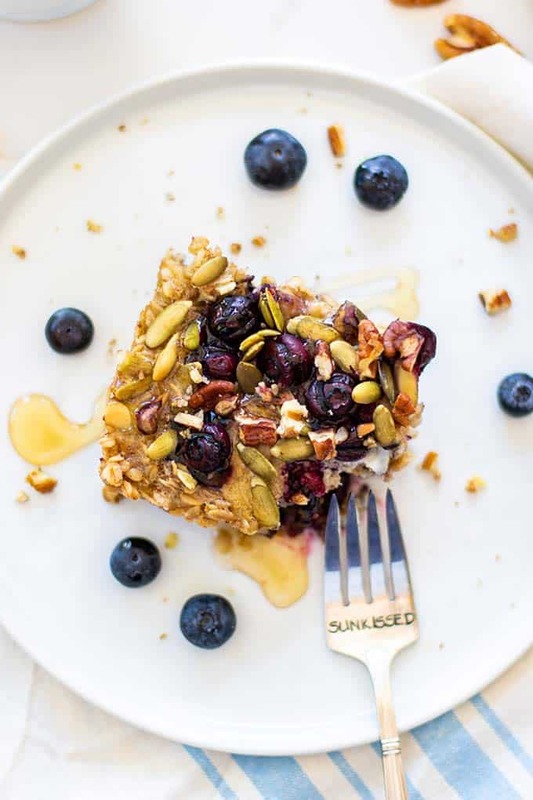 After the healthy baked oatmeal is cooked, you can refrigerate it for up to 4 days, and reheat slices as needed. This casserole also freezes well. Once it’s baked, freeze individual servings in air tight containers, and bring out to thaw and reheat as necessary. 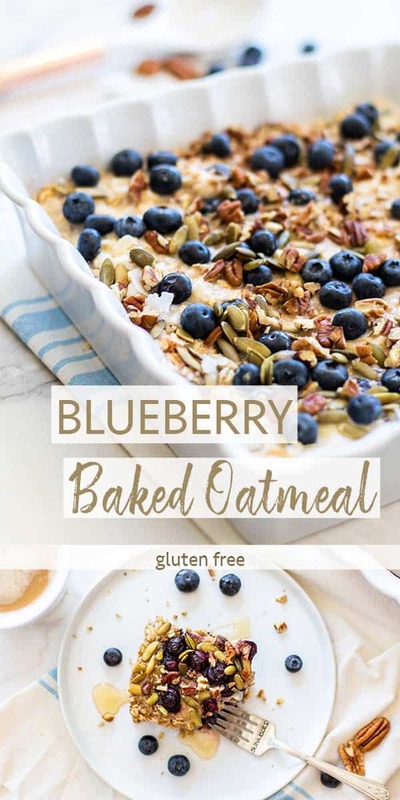 A healthy oatmeal breakfast casserole made with juicy blueberries, toasted pecans, and sweetened with ripe bananas. This is a great make-ahead meal and can feed a crowd, or can feed your family for several days. 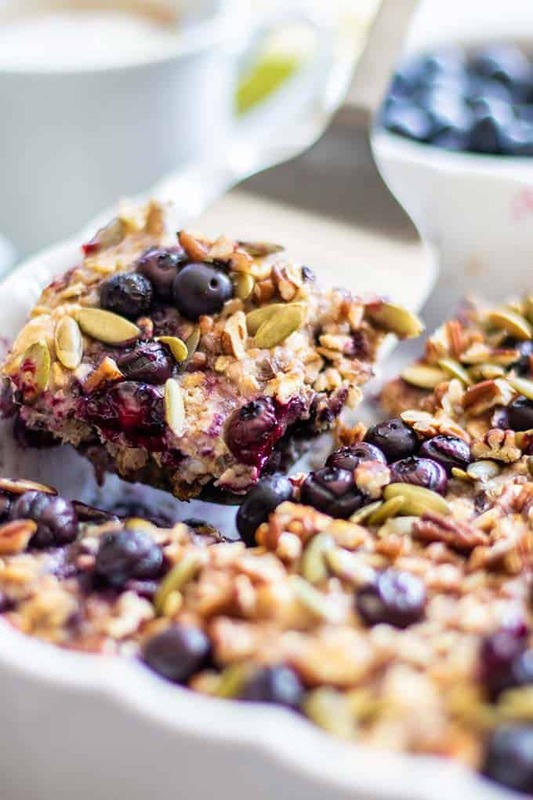 Add 2 cups of blueberries to the bottom of a 11x11 square baking dish (or a 9x13). In a small bowl, mix together oatmeal, baking powder, sea salt, and cinnamon. Mix well, and then sprinkle over blueberries in baking dish. Using the same bowl, mash bananas. The more ripe your bananas are, the sweeter your oatmeal will be. If your family prefers sweetened oatmeal, you can add 2-3 tablespoons of the sweetener of choice in with the banana. Add eggs, almond milk, and coconut oil to the bananas, and stir together. Pour over the oatmeal mixture in the baking dish. Top with reserved 1/2 cup blueberries, and sprinkle with pecans and pumpkin seeds, or other desired nut or seed. Serve hot, and drizzle with honey or maple syrup, if desired. 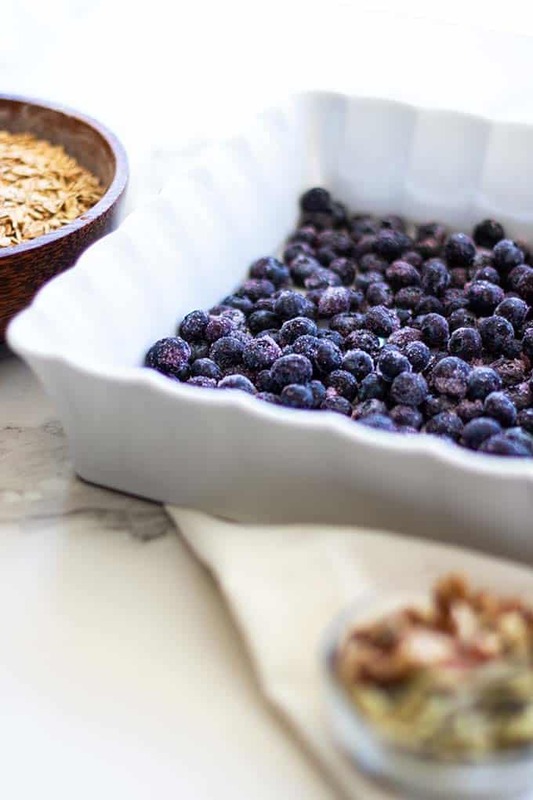 Baked oatmeal can be stored in the refrigerator for up to 4 days, or frozen in an airtight container for up to a couple of months. Reheat individual portions as needed. This post may contain affiliate links, meaning if you make a purchase, I will receive part of the sale as a comission. This helps me continue to bring you lots of fresh and inspired recipes! Love it! What a great way to start a day! Thanks Tania -- I love this breakfast and it's great for when there's lots of family around! Looks very pretty. What could you use as a banana substitute? I was wondering about a homemade applesauce? Applesauce definitely would work in this recipe and be a great sub -- however, bananas are sweeter than applesauce. I wouldn't mind it being less sweet, but some people would. If you'd like, you can add a couple tablespoons of honey or other favorite sweetener to make up the difference. This was very easy to make, and the result was delicious. I am really glad I came across this recipe. It will be a new breakfast staple in our house. I'm thrilled to hear that! Thanks so much for letting me know. I just ate the last piece I had frozen from my last batch and I think it's time for a new one! It was regular oatmeal -- but honestly, I bet both kinds would work! Good luck :) Love this oatmeal. This looks great. I can’t wait to try it. Can you make it the night before, leave in the fridge and bake in the morning? And even with frozen berries? You absolutely can leave it overnight. I am not sure if the banana will turn dark -- that's what I would worry about more than the berries. Enjoy! I just tried making this and I just have to say thank you for sharing such an amazing recipe. It was absolutely delicious! I will definitely be making this again. So glad you enjoyed it -- thank you for letting me know, Mariam! We really enjoyed this this morning! I only had one banana so I added 1/4 cup maple syrup and I made in a 9 x 9 dish. Thanks for posting! I am so glad you enjoyed it! Thanks for letting me know. The maple syrup I am sure was wonderful!